You always hear about senior leadership and how it makes such a difference in the closing moments of high school basketball games. The Kimberly Bulldogs made that case Wednesday night with a 77-71 overtime victory over the Wood River Wolverine boys in the season-opening game for both teams. Kimberly, bringing eight seniors, had four of them on the floor in the four-minute extra period for coach Marvin Mumm and they were cool in the clutch—making 10-for-12 at the free throw line for a 13-7 edge in the overtime. Hailey coach Andy Miles countered with one senior, Eron Bates, and four juniors in the decisive overtime. Two of the juniors, Arthur Brugger and Douglas Mason, are new to the team this year. They all played well, but weren’t quite in sync as the ‘Dawgs. That was the difference between the two traditional hardwood rivals in an entertaining and high-scoring contest that heated up the Hailey gym on a bitterly cold night. Indeed, Wood River’s 71 points represented the most points scored by a Hailey boys’ team in 110 games dating back to a 72-57 win at Hillcrest in Jan. 2008. And you have to go all the way back to Dec. 2, 1999 to find a contest in which Wood River scored 71 at home. Bates, a 6-3 senior, one of two seniors on the Hailey squad, was a force close to the basket with 18 points, 15 rebounds and 3 assists. His basket on a Cody Carter pass with less than a minute remaining in regulation fueled a 6-0 Wood River run that forced OT. Carter (9 rebounds, 2 steals, 3 assists, 1 block) tallied 14 of his 18 points during a first half that ended with a 33-33 deadlock. The smooth-shooting junior sparked a remarkable 10-0 run at the end of the first quarter that erased a 16-7 Bulldog lead and showed Wood River was up to the challenge. Wood River fans were familiar with Bates and Carter. Brand new to the home supporters, however, was the athleticism and adrenalin brought by newcomers Brugger and Mason, two quick 6-3 juniors who were on the floor in the final moments. Brazilian exchange student Brugger (10 points, 2 assists) and Mason (12 points, 3 rebounds, 2 steals, 1 block), newly transplanted here from Virginia, were the other two of four Wolverines in double figures. It might have been five, if 6-5 senior Kevin Hernandez (7 points, 7 boards) hadn’t left the game with an ankle injury. With nine seconds left in the fourth quarter, Brugger drove to the basket behind a Bates screen for the game-tying basket at 64-64. He got that opportunity because junior guard Connor Hayes had stolen the ball on the Hailey press and made a basket making the score 64-62. The Hailey boys (20 turnovers) were not as careful with the ball as Kimberly (11 turnovers), but they out-rebounded the Bulldogs 37-25. On offense, Kimberly finished with seven 3-pointers from six different players. Wood River had three. And of course the free throws were vitally important. Kimberly finished 22-for-34 at the line, compared to Wood River’s 16-for-24, and that six-point difference between the two teams at the stripe turned out to be the final spread. Kimberly put 11 players in the scoring led by senior Jordan Cress (16 points including 5 in overtime, 3 steals, 3 assists) and 6-4 senior post Hayden Hatch (13 points, 8 rebounds including 4 in OT, 2 steals). Seniors Alex Millward (9 points) and Dakota Ray (7 points, 8 boards) played big. The Wolverines showed depth with eight players in the scoring including Hayes (2 points, 2 assists), Alec Nordsieck (2 points, 3 assists, 1 block) and Jon Scott (2 points). 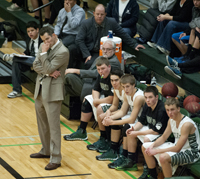 Wood River visits Filer Friday, Dec. 6 and goes to Gooding on Tuesday, Dec. 10. The Wolverine junior varsity put 11 players in the scoring and won their game 53-34 over Kimberly Wednesday night. Junior Santiago Gomez scored 10 of his team-high 16 points in the first half when Wood River built a 34-14 cushion. Cade Schott added 8 Hailey points. Others were Travis Swanson 5 points, Austin Shetler 5, Drew Kaminski 4, Sam Burns 4, Jordan Bjorkman 3, Nelson Cantrell 2, Rolind Solis 2, Nic Tidwell 2 and Wes Moore 2. Bridger Gunnell (15 points) topped Kimberly’s JV.